NOTE: All content here is still in development and may change dramatically throughout the development cycle. I present the content as it currently is, but it is by no means set in stone. First and foremost, I’m excited about new content and sharing it with the community. There’s just something magical about seeing a design come together and thinking “I did that.” But beyond that I want to share my thought process and talk about what I’ve learned from designing and programming three levels around a few very small changes to the original formula. Most of all, I’m hoping to spark some conversation and see what others think. Did I miss something? Is there something you would do differently? I’m here both to present my findings and learn. Designing is useless if one can’t explain their reasoning and that’s just what I aim to do here. If you thought you’d be running the same old mazes over and over in Remember, Remember, boy are you going to be disappointed. Each maze the player encounters after the first will be a variant on the original formula. Each new maze variant is themed around a different emotion or feeling the story is trying to evoke. In this particular setting, the major theme was being rushed or in a hurry. To emphasize this thematically in the game, I decided that the major change this variant would bring would be a significant reduction in time to run the maze. This creates an atmosphere of pressure to move faster and find more efficient ways to move through the space. With this consideration in mind, I set to work deciding what changes to level and monster design needed to be made to really emphasize this feeling and mesh with the tighter time limit. The first part I wanted to tackle was how the player would move through the maze itself. If players were expected to finish this maze in a timely manner there had to be an intelligent way to move through the maze built in. I started out each board (a “level” or “version” of the maze, think of it as a physical game board) by defining the player’s starting position and a typical path for them to take. This way I could understand how I would be guiding the player to an optimal solution. The rest of the board could then be designed around this path. These paths didn’t always end up being the BEST path, but they did help frame the base good experience for the player. Example of a board nicknamed “Loop”. Arrows show interesting paths for the player to take. With the base paths implemented it soon dawned on me that a maze with just a singular path is not much of a maze. As I added the walls around the base path, I remembered an amusing bug I had found in my programming that allowed me to create one-way walls. I started using this “bug” as a feature and it allowed me to add interesting player decisions to an otherwise linear maze experience. Finally there was the issue of the unpredictable monster. The traditional monster was create to wander the maze as a type of “minotaur,” only attacking the player if they came too close. The player was incentivized to sneak around in the dark and avoid the this monster. This maze variant, however, was not built for sneaking or caution, so the monster design was in direct opposition of the variant’s design. Additionally, from a technical standpoint, some computers had been having lag issues with the computations required to play the maze, making moving quickly an impossibility. If I wanted to create an environment that enabled the player to move fast, the monster had to be less computationally demanding so all players could enjoy it. I created a new monster whose movement path was determined by tracking the player’s movement step for step. 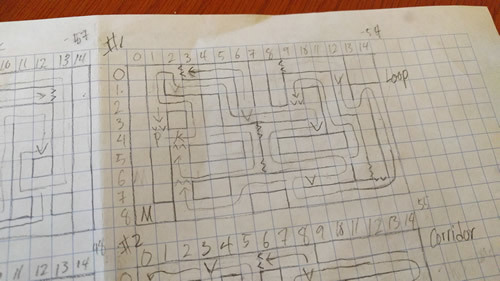 This design was both less computationally demanding (no pathfinding algorithms) and created a predictable pattern of monster movement that punished the player only for taking wrong turns or moving through the maze slowly. It was the perfect fix to both my issues! I’m just beginning to scratch the surface of this variant’s design, but I won’t take up any more of your time. I’ll be back next week with insights I had while working under this variant’s restrictions and general level design knowledge I gained while creating the boards! I really like the idea of one-way walls, especially in a ‘rush’ maze. When making decisions in a rush, you often have to make a choice without knowing the full weight of the consequences. By the time you can evaluate it’s effects, it’s too late to backtrack. Yeah that was a big part the idea there. Hopefully it turns out to be more interesting than frustrating, haha.